Mini-ITX motherboards have been around for quite some time, going all the way back to the distant days of VIA's original EPIA designs. Each time the format got its turn in the spotlight though, it was shot down in flames. Not many folk gave it a second thought, mainly because the wee board size simply couldn't deliver the power most of us demand from even a small PC. It was only when processor technology started stealing motherboard components and integrating them on-die that one or two motherboard companies began stuffing Sandy Bridge goodness into the 17cm square platform. Then people suddenly woke up to the fact the format could be in fact the basis for a pretty powerful system, and the dinky motherboard hasn't looked back since. Along with the rise in popularity of the wee boards has come the increasing demand for something stylish in which to put them. One of the latest cases to support the format comes from those masters of the brushed aluminium chassis, Lian Li, in the shape of the PC-Q03 cube. The first thing that catches your eye when the PC-Q03 is unboxed is just how good the build quality is and, in the case of our review model - the PC-Q03B - the quality of the black anodised finish. The case is also available in silver with an 'A' tacked on to the end of the name - PC-Q03A. It's also rather astonishing just how light the chassis is - empty it weighs in at a mere 1.57kg. Accessing the inside of the case is a doddle - the two side panels simply clip into place - and when it comes to removable items to help the build, the PC-Q03B puts many a full-size case to shame. The motherboard tray, hard drive cage and the optical drive cage can all be completely removed from the chassis itself. Sadly though, the hard drive cage is the only tool free item - the rest need a screwdriver. Two PSU brackets are supplied (held in place by thumbscrews), which allow either an SFX or ATX power supply to be fitted, but there is a 160mm length limit to keep in mind when choosing a power supply. Similarly, there is a 180mm length restriction to the graphics card you can fit into the case. Full length cards then are unfortunately off the menu for the Lian Li. We do have a few concerns about the cooling options for the chassis though - it's a fanless case design, which is something you'll need to keep in mind when choosing a CPU and graphics card (if you are intending to use one) in the build. We would also like to see a few more tool-free options, but with these small format cases, there's a limit to what you can really do. 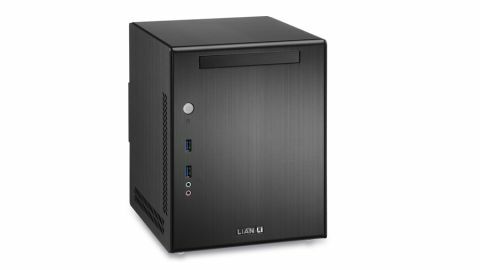 As with most things Lian Li though, a lot of thought has gone into the PC-Q03, and while the cube shape might be everyone's cup of tea, there's no arguing with the build quality and finish. We also like being able to decide which type of power supply to use with the case, as build options tend to be a pretty rare thing among smaller case designs like this.